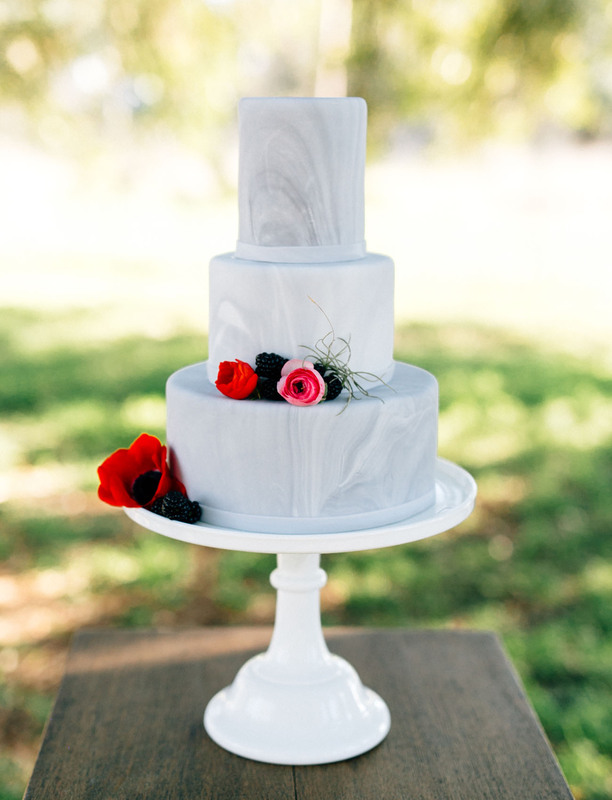 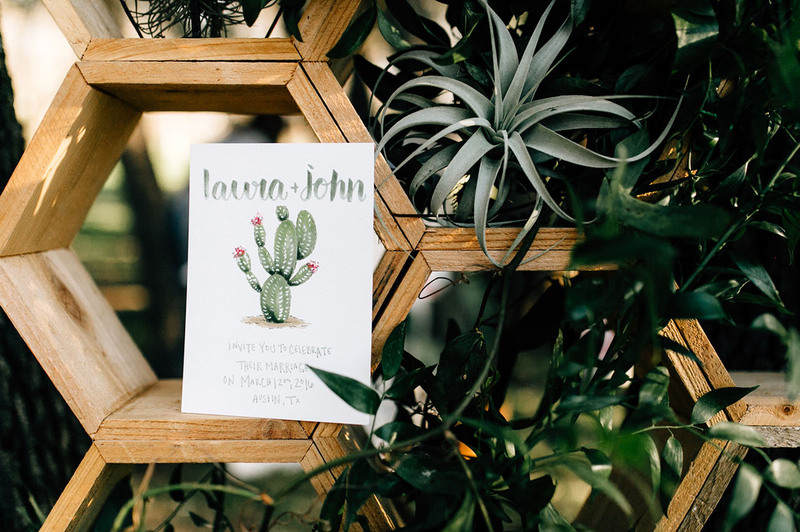 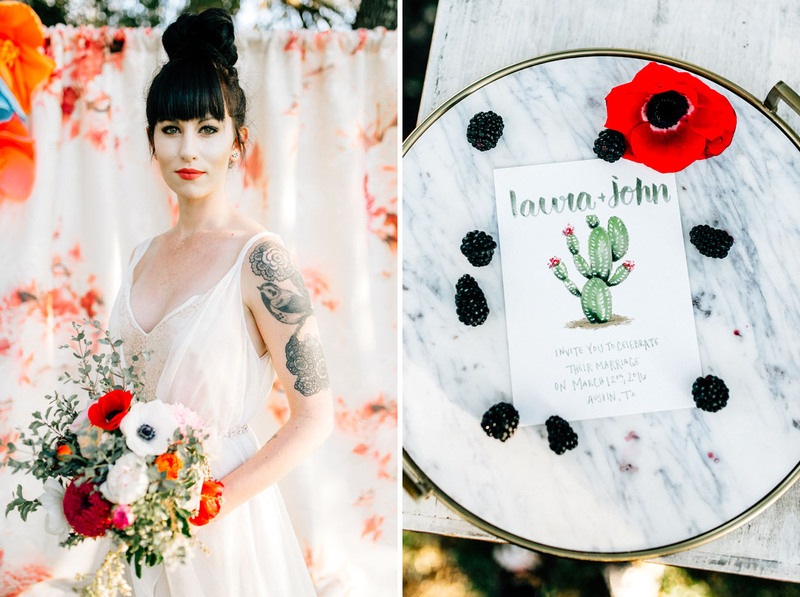 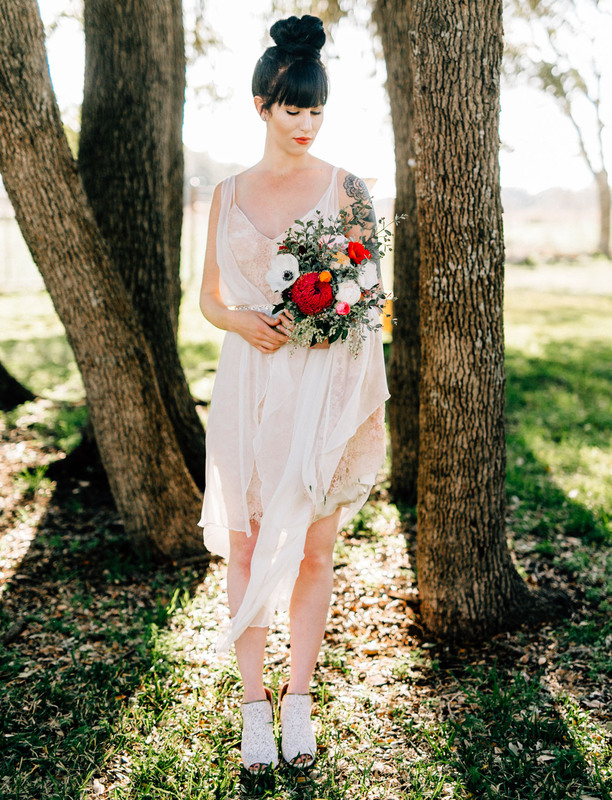 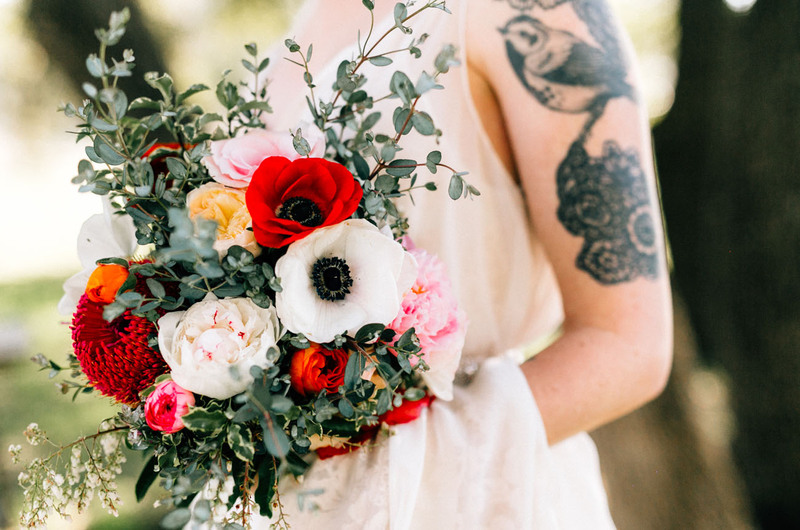 Inspired by an unexpected combination of elements – Summertime, Texas, and a sweet, prickly pear cactus – Gloria Goode, who planned, designed + photographed today’s editorial, worked with a team of local Austin vendors to help inspire brides to think outside the box. 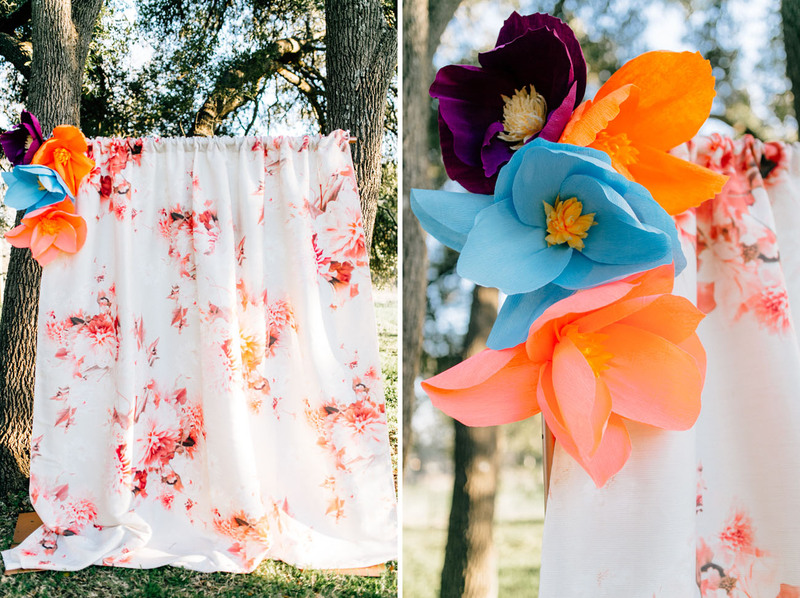 Gloria says, I incorporated trends that I felt were going to be big this year. 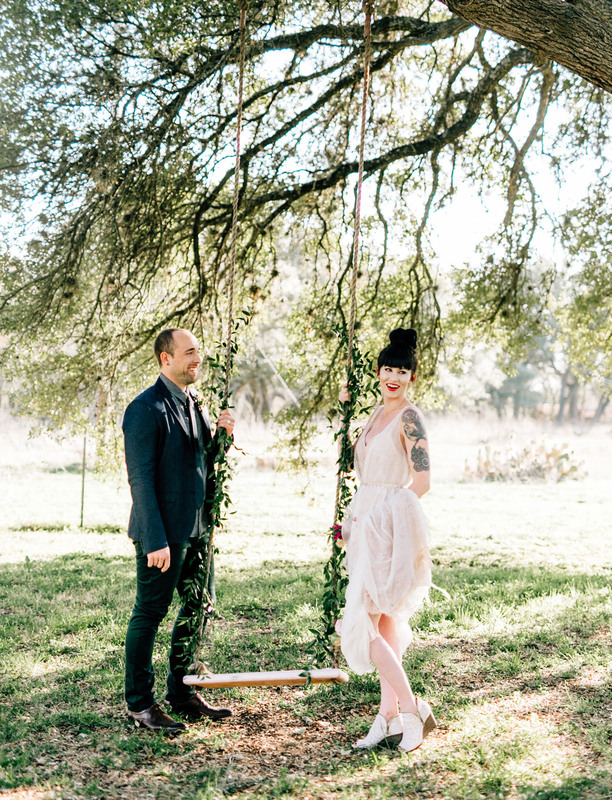 For example, after seeing Whitney Port’s gorgeous high low wedding dress I thought that it would be a popular choice for brides so we used the same style (by Moonlight and Moss) for our shoot. 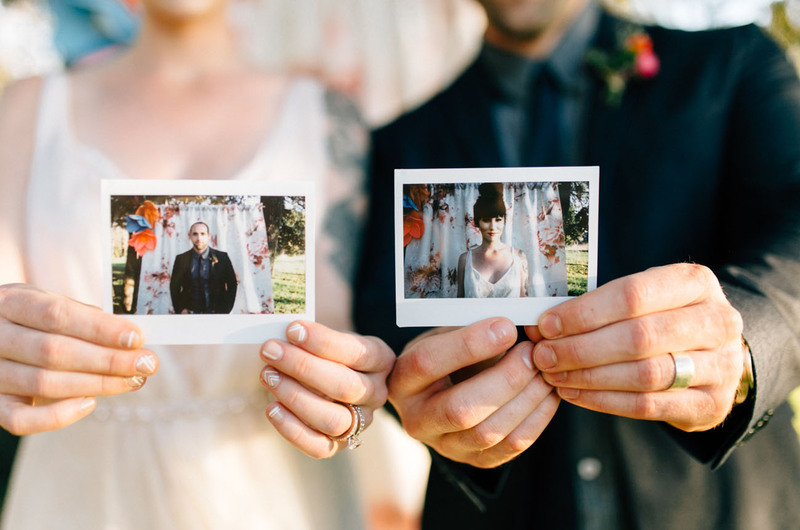 Another trend on the rise: the use of instant cameras and backdrops. 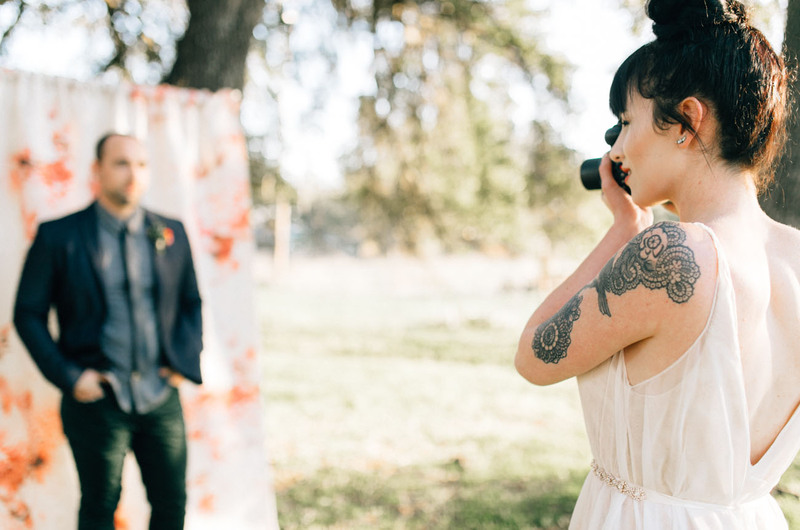 This idea has been around for a while, but it has really picked up the pace lately. 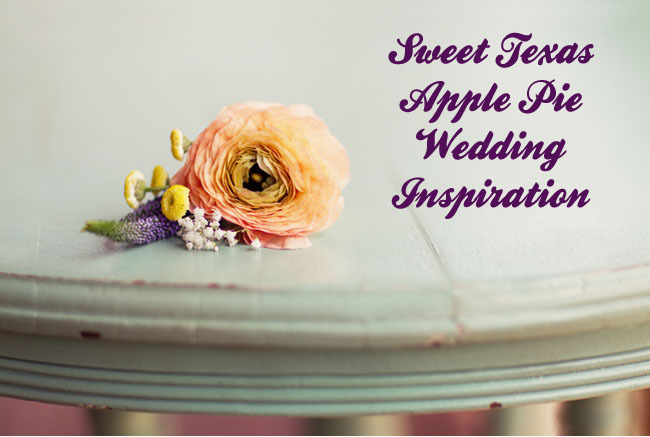 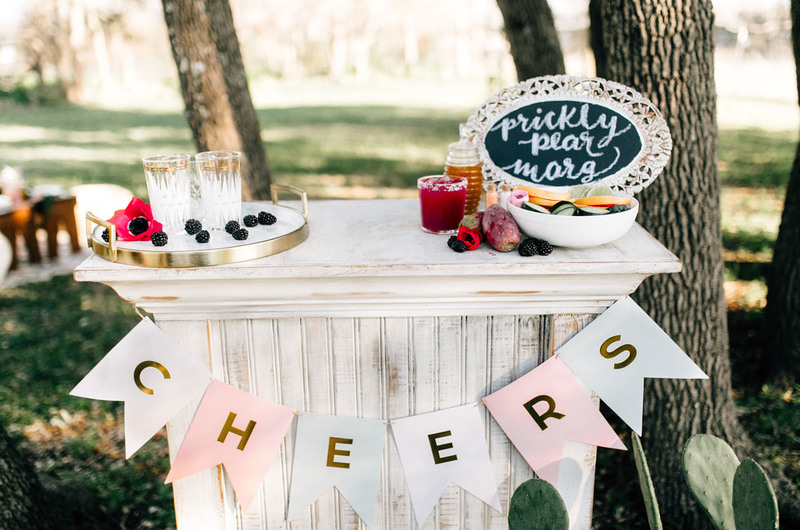 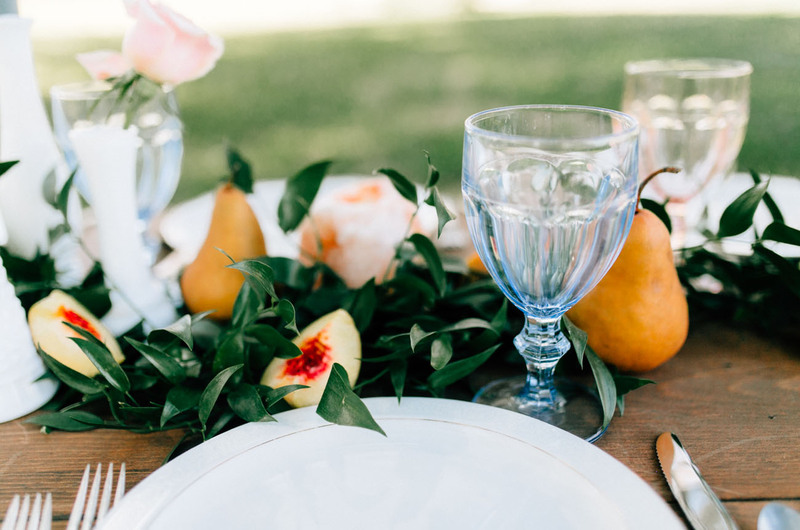 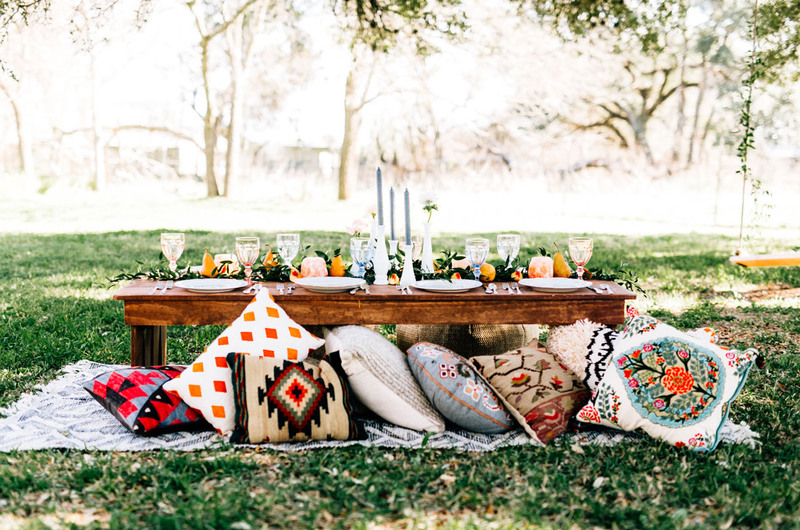 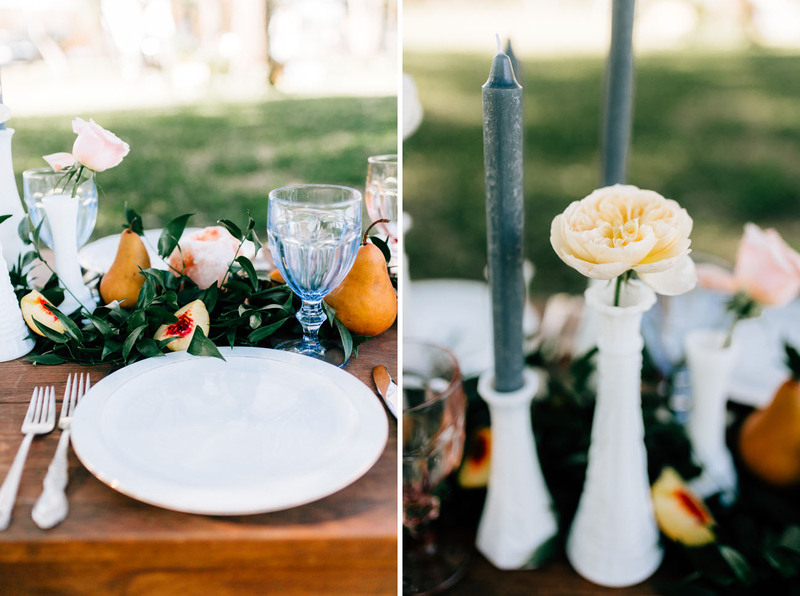 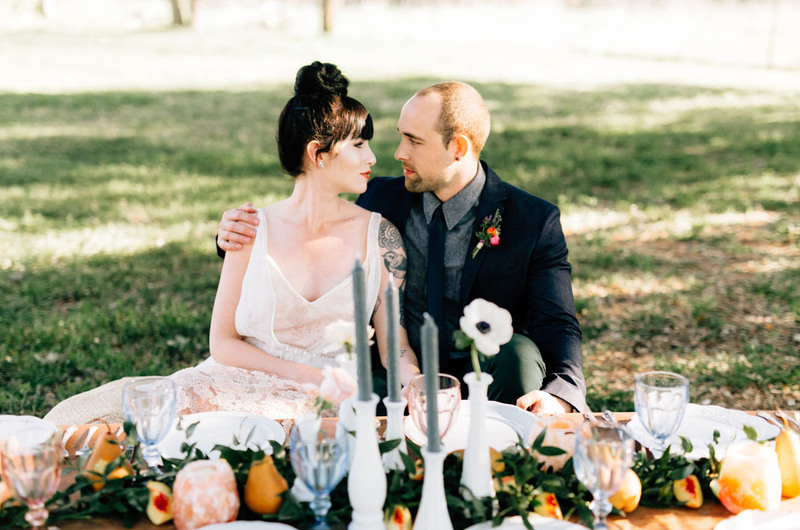 With the popularity of Instagram a lot more brides are going for laid back, intimate affairs which is why the idea of a picnic style table seemed so right for this shoot. 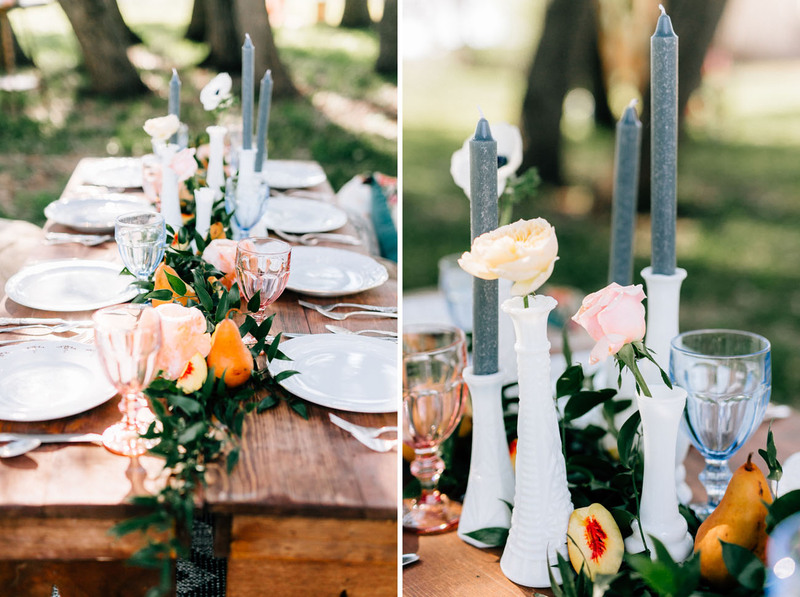 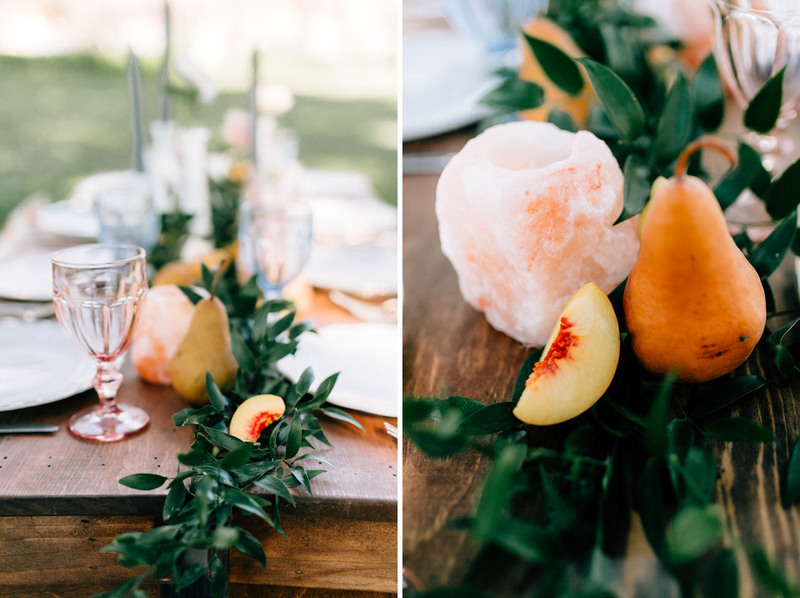 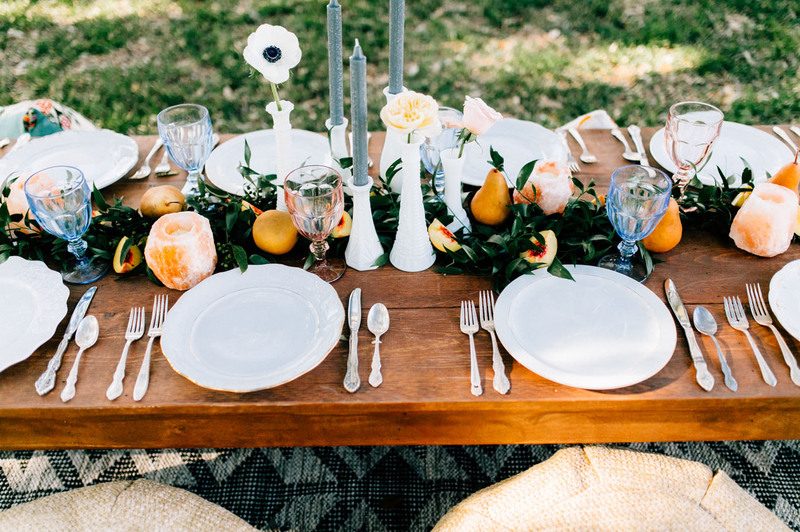 Complete with geo rock candle holders and natural elements like peaches and pears this table really set the scene for an organic summer feel. 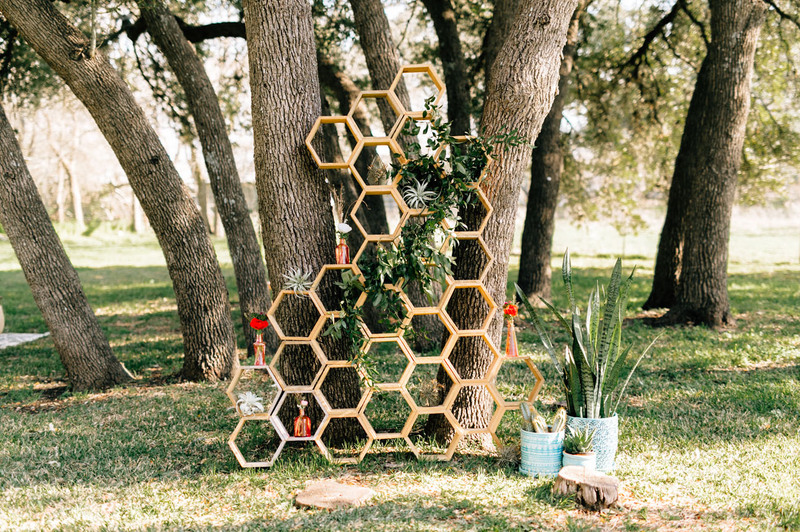 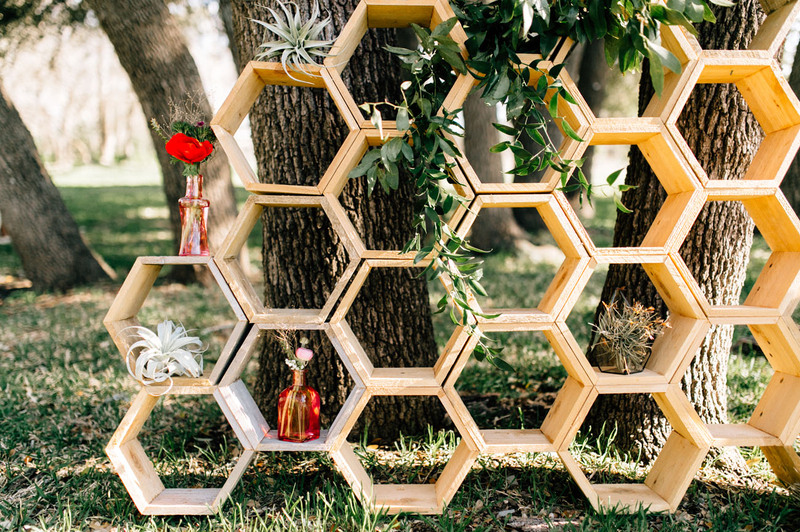 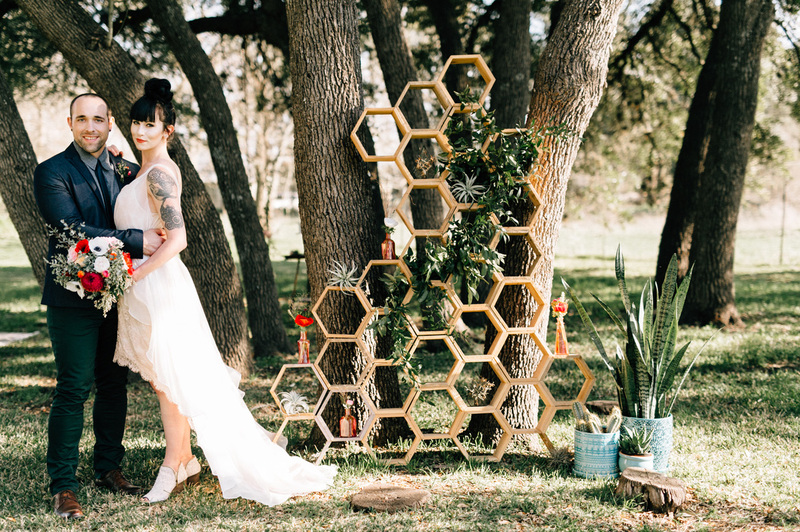 This fun handmade honeycomb backdrop by Bee Lavish Vintage Rentals was a great statement piece to stage the ceremony site vignette. 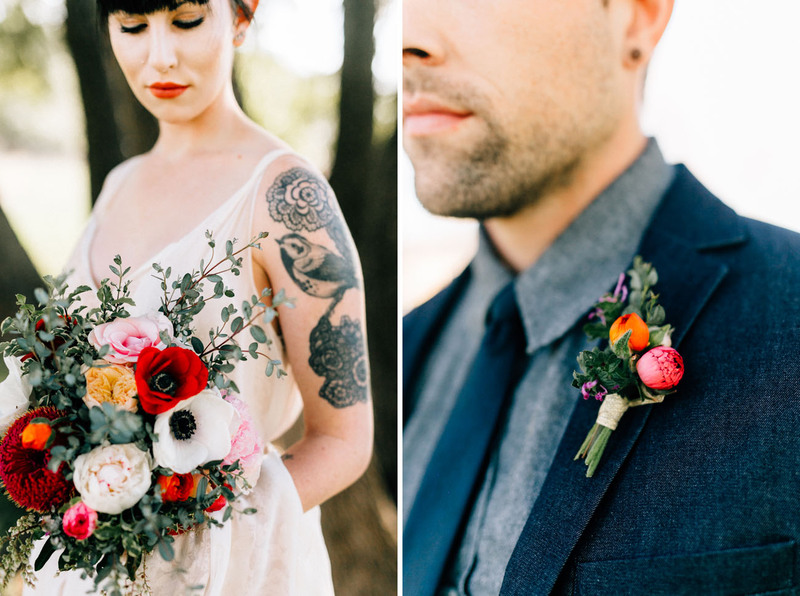 And vibrant florals, by Remi & Gold, were a perfect match for the bride’s relaxed wedding dress + groom’s stylish, casual attire. 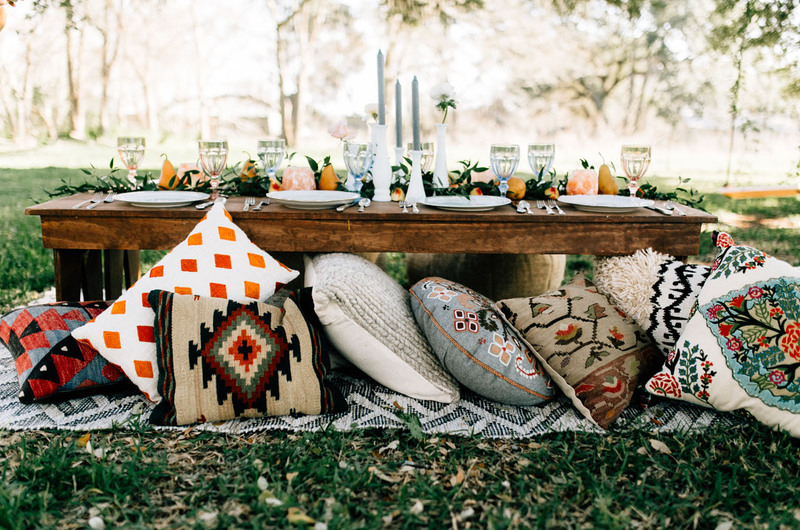 Bee Lavish Vintage Rentals also had the perfect pieces to create a laid-back garden party feast + we were so inspired by this look (which could work great for a bridal shower, summer BBQ or sunday brunch) that we’ve put together a collection of our current fave rugs + pillows so you can get the look for your next event! 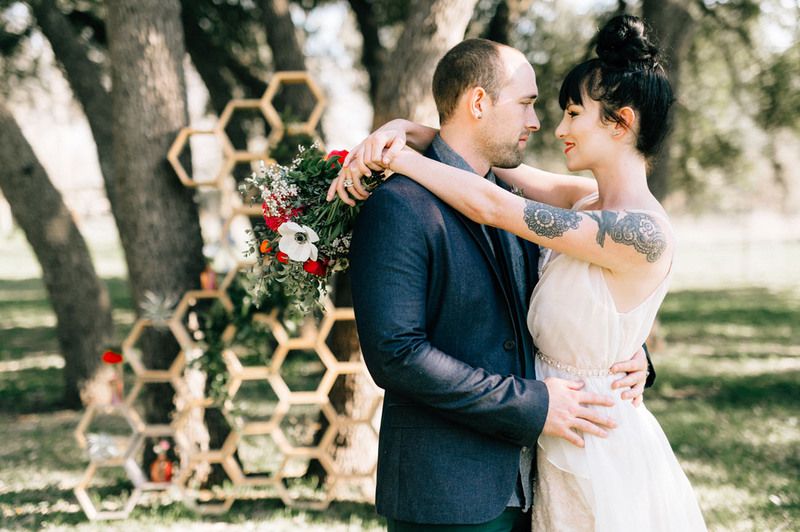 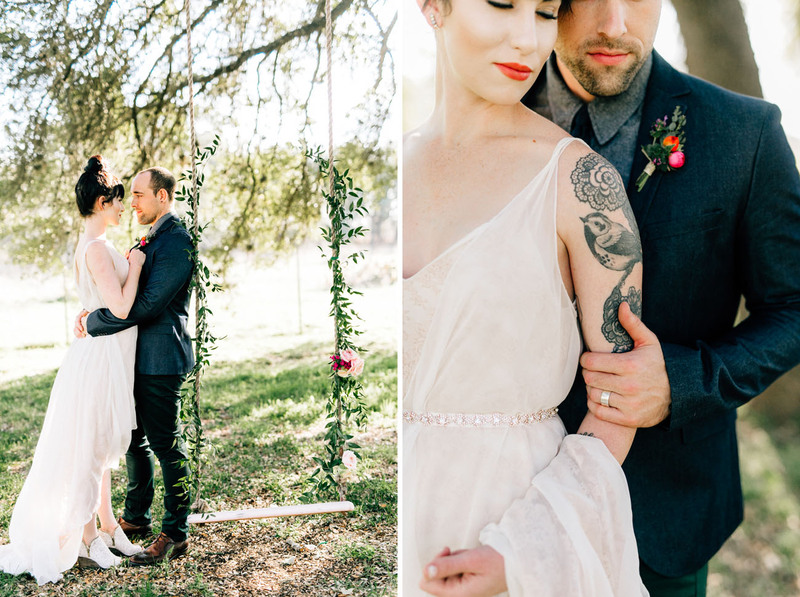 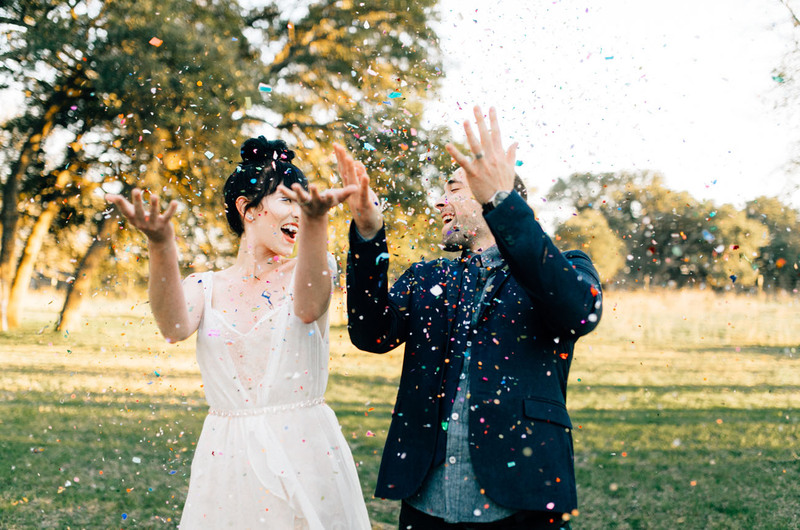 YES to this fun top knot for the bride! 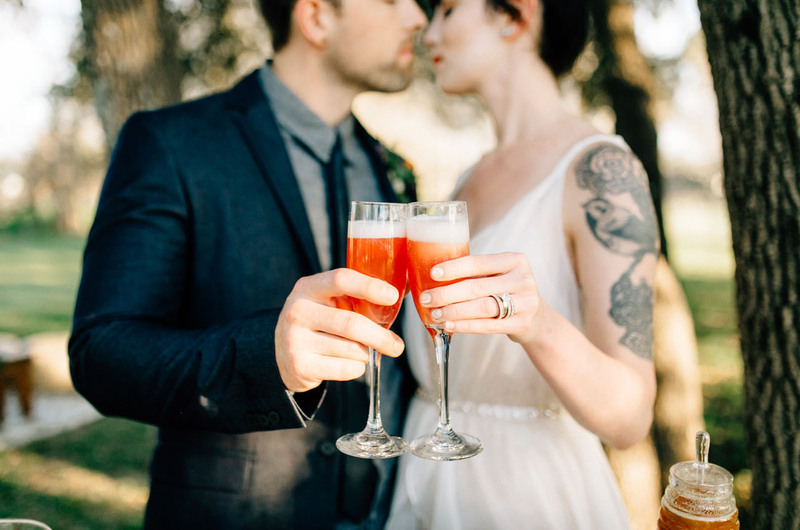 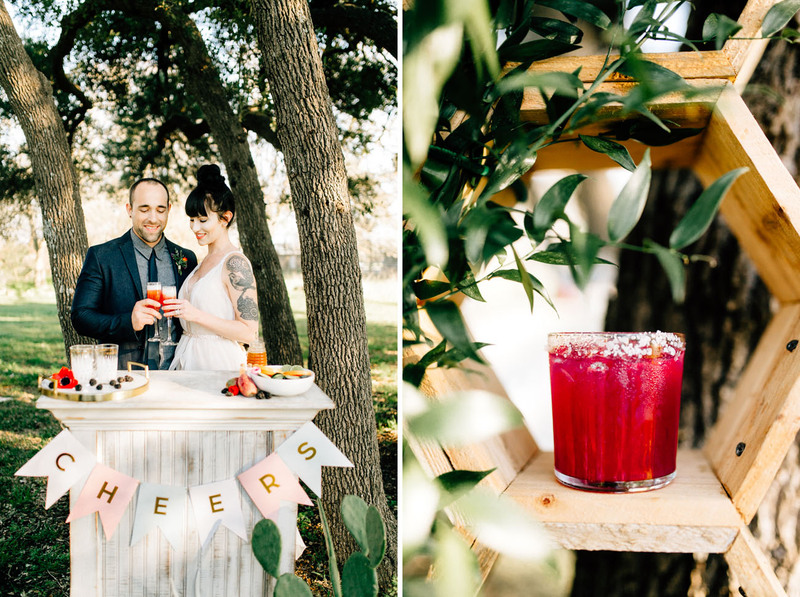 Perhaps one of my favorite parts of this shoot was the prickly pear cactus margarita hand crafted by a husband and wife team at She + Him who set out to create a unique bartending experience for couples by making drinks that are personal to them. 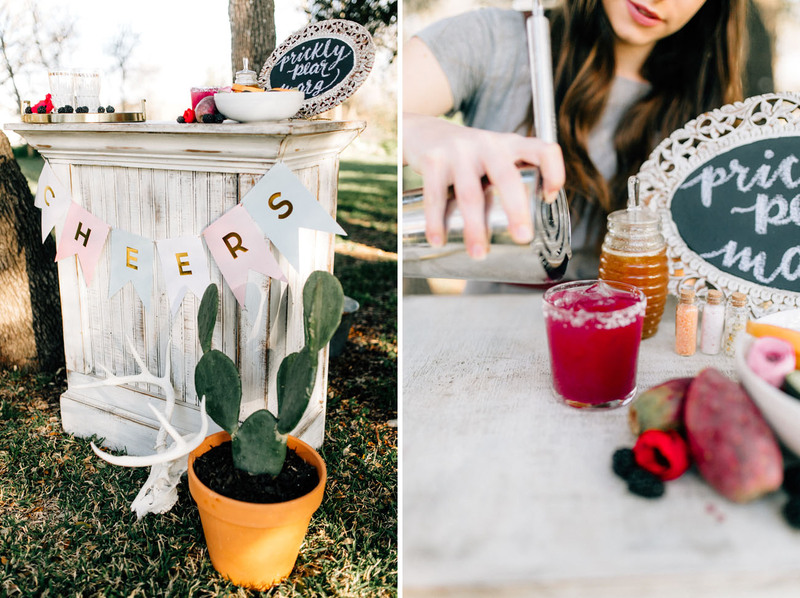 Thanks so much to all the talented team of creative below who put together this fresh, stylish shoot!